Silvio Stampiglia, one of the most prolific librettists of the early 18th century originally wrote his libretto in 1699 for Naples. It is in fact dedicated to the myth of the founding of the city of Naples. First set to music by Luigi Mancia it was later that several others also used the libretto, among them Antonio Caldera and, most famously, Handel (King’s Theatre, 1730). Handel may have seen Caldara’s opera in Venice ca. 1710. It was also for Venice that Leonardo Vinci composed his Partenope, though it was then entitled Rosmira fedele. Why the title was changed is open to debate, but one reason could be that it was a homage to Faustina Bordoni. She had taken the title role in Naples a couple of years earlier in Domenico Natale Sarro’s setting of the text but in Venice she was instead Rosmira. The story is rather typical of early 18th century operas: ‘love and jealousy, duels, battles, deceits, disguises, and a touch of moral lesson’: Dinko Fabris, from the liner-notes. Structurally the opera is divided into three acts, each of which is preceded by a comic intermezzo, where Eurilla and Beltrammo comment on the serious plot to be unfolded in the following act. It was out of a similarly structured opera, Il prigionier superbo, that Pergolesi extracted the two intermezzi that became La serva padrona. This had its own life - and still has - as one of the foremost early buffo operas. Less than a year ago I reviewed another opera by Vinci, Artaserse, (review), which was a revelation. I made it my Recording of the Month and even quite recently Recording of the Year. This is a CD-set with no visual distractions. With the present Partenope one has to take the visual aspects into consideration as well. Sets and costumes are blissfully ‘authentic’. I’ve seen baroque operas in modern disguise that have felt like valuable bridges between history and present day. These have included camouflage uniformed soldiers with machine-guns and a swimming-pool with sharks in a production of Giulio Cesare. it is a relief to find no gimmicks distracting from the central story and music however complicated the former may be. The effect of the sets is like stepping into a baroque painting and the costumes are voluptuously beautiful. Lighting effects add to the atmosphere and there is a grand, spectacular finale with acrobats. 18th century audiences must have liked this. Spectacular and colourful it is, anyway. 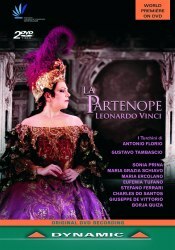 Musically La Partenope may not reach the heights of Artaserse but it is delightful, with some true high-spots. Partenope’s aria in the first act, Non posso amarti, o Dio, is one of those with a particularly enchanting orchestral interlude. In the second intermezzo there is even a fandango with castanets. Rosmira’s aria in act III, Vuol tornare a la sua sponda, full of coloratura excesses, is truly charming. It’s also well sung: the best singing in this set. Maria Grazia Schiavo is elsewhere too vibrant for my taste, but her technique is impressive. That also goes for Sonia Prina in the title role. This Italian contralto has made baroque opera her speciality. She is the dominant personality in the cast both dramatically and vocally. The rest of the cast are only middling. Stefano Ferrari’s Armindo is rather pale and uninspiring, Maria Ercolano’s Arsace has fluent coloratura but the delivery is rather dull. Eufemia Tufano (Emilio) is a good singer but a bit lacklustre. The final verdict: delightful music, beautiful sets, middling singing - but Sonia Prina in the title role is great.